I don’t really remember what year it was…I was maybe five or six. I do know it was the year that Santa brought me my heart’s desire. A Shirley Temple doll. 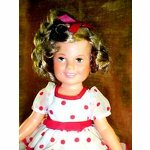 The Ideal Doll Company had just put out a new version of Shirley Temple. She was in the Montgomery Wards catalog. She was beautiful. And she had clothes. I had even braved sitting on Santa’s lap (always an exercise in terror control for me) at a children’s Christmas party so I could whisper what I wanted in his ear. How could you not love Shirley? Here she is with Bojangles in my favorite dance sequence from The Little Colonel. I was a big doll girl. I had a collection, as a matter of fact, that included a Madame Alexander Scarlett O’Hara with green eyes, and a set of handmade Dolls Around the World. Still do, though, maybe ironically, neither of my daughters have any interest in dolls (they find the eyes a bit creepy) so my collection is packed away. And, maybe also ironically, I don’t have that Shirley Temple doll anymore. She was well played with, so well-loved. I loved everything about her: her little red Mary Janes, her knee socks, her curls, her dimples and her frilly dresses. I remember running into the living room where the tree was and seeing Shirley on the fireplace hearth where Santa always left his gifts. I think I cried a little. I wasn’t a big squealer but I probably did that too. I don’t remember anything else I got that year (did I get anything else, Mom?). I just remember thanking Santa over and over in my head: Thank you, Santa. So much. For bringing me Shirley Temple. I love her. Love, Kecia. What about you? Did you ever get your absolute heart’s desire from Santa? And was it everything you wanted it to be?